In the very early times many of the stars were very massive. They consisted almost entirely of hydrogen and helium and traces of lithium and deuterium (which were destroyed very early in the life of the star). They burnt very fast and collapsed in huge supernovae explosions. Some left black holes behind – other underwent an only recently discovered form of explosion called a pair instability super supernova. Although this was known of theoretically for some time it was only very recently that such an event was observed. A star over 200 times the mass of the Sun underwent a supernova explosion known as a pair instability supernava. The gamma radiation was so intense that a reversal of the normal reaction Electron + Positron = gamma radiation occurred. Radiation was creating matter/antimatter pairs. These went on to annihilate to produce more radiation and so on in a feedback reaction which blew the whole star apart. The star Y-155 exploded about 7 billion years ago, when the universe was half its current age. It was discovered in the constellation Cetus (just south of Pisces) with the National Optical Astronomy Observatory's (NOAO) 4-m Blanco telescope in Chile in November of 2007. The entire star exploded. No neutron star, no black hole, nothing was left behind but an expanding cloud of newly radioactive material and empty space where once was the most massive item you can actually have without ripping space apart. On 21 July 2010 astronomers announced the discovery of an extremely large star in the Large Megallanic Cloud, a small satellite to our own Milky Way Galaxy. It has shattered the record as the most massive stellar monster ever seen. 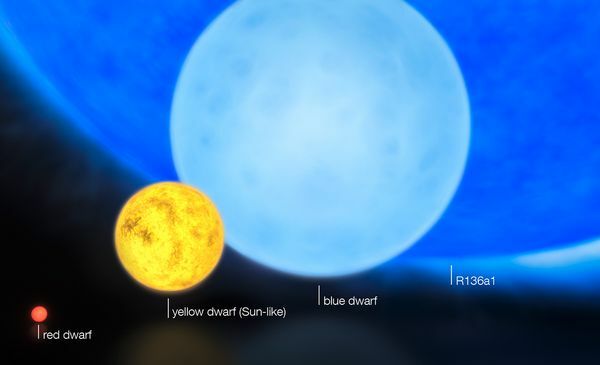 It has a mass of 265 times the mass of the Sun and may have actually slimmed down since birth, when it may have tipped the scales at 320 times the Sun's mass. The discovery could rewrite the laws of stellar physics, since it's long been thought that stars beyond a certain mass would be too unstable to survive.